Luxury, spacious log mountain home is located in Hendersonville, North Carolina, offers outstanding views of the beautiful Blue Ridge Mountains. Secure your stay 24-7 on line here for Mill Spring, Tryon International Equestrian Center WEG EVENT. Asheville Regional Airport, Ashville art walk, shops and restaurants. Watch incredible sunsets while sitting comfortably on the covered or uncovered rear deck. Inside the home you are enveloped by the warmth and comfort of wood, and uplifted by the stunning Blue Ridge vistas. The master bedroom is on the first floor, with a king bed, tv, and a view out atrium doors to the mountains. The master bath has a soaking tub with stone walls and a separate shower. The downstairs includes Full Bath and 2 Bedrooms, 1 called the Moose Room includes a King bed, and the Bear Room has a Queen bed, the Open area includes TV and sleep sofa. A separate apartment over the garage has its own entrance and a Queen Bed, twin couch hide-away, kitchenette, Full bath, and tv. In the main home, two main living areas and a loft provide flexible relaxing options for you and your family. The kitchen, fully equipped with everything you need to have a great stay in the mountains, allows for easy socializing with just an island separating it from the dining area. While cooking a great dinner, relax on the deck, drink some wine, and watch the best sunsets ever over Cold Mountain. 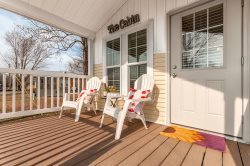 This home is located just minutes from some of the top golf courses in NC, in addition to historic downtown Hendersonville, Asheville, Chimney Rock State Park, Flat Rock Playhouse, DuPont State Forest, and the Carl Sandburg Home National Historic Site. Convenient to Greenville-Spartanburg Airport and Asheville airport. Long-term renters are welcome, children are welcome, non-smokers only and no pets. Perfect home for a Family- Friend Getaway. We will call you to greet you to our area. Note: Guest making reservation must be at least 25 years old. Great care is taken to maintain the appearance and quality of the home so any damage evidenced outside the normal wear and tear will be subject to the security deposit. Thank you. Hiked Carl Sandburg property and drove the Blue Ridge Parkway, the leaves, Graveyard Fields/Falls...Saw deer right near cabin and turnways. Luxurious King Bed, bureau, over-size size walk in closet, TV, and atrium door to patio and View! Wooden swing on front lawn to relax and swing on. Do not use Fireplace, NOTE: Brand new Faux Fireplace for ambiance. NOTE: Please do not use the fireplaces inside the House. Thank you for making our New Year’s a great one! We were able to gather friends from all over North Carolina and Atlanta to ring in the New Year and this house was very accommodating. We were able to watch all the football and basketball games on and we even had a Wii tournament. We’d recommend this house to anyone!!! Absolutely a fantastic place, we only wished our 4-legged friends could have come- especially with the fenced in area. No worries though because we will be back and our pups were all ringing in the New Year together so everyone wins! We had the best time staying in Asheville and Hendersonville at your house! Thank you for your hospitality! Sending good vibes. Thank you Roy and Cheryl for sharing your home with us. We had a wonderful Easter/Birthday celebration with extended family. What a beautiful place! We enjoyed the view from the decks and the sunsets! The firepit proved useful and we enjoyed it. What a perfect home base- it was an easy trip to go view the solar eclipse! WOW! Thank you very much. We traveled from Hampton, VA., Kalamazoo, MI., Cleveland, Oh., Detroit, MI, & Niles, MI.
. Note: *There is a wonderful fire pit outside, with plenty of wood and kindling for you, and chairs around it. Strip the beds and put all used sheets, pillow cases and towels in laundry baskets provided in each bedroom. If you wish, you may start a load of towels in the washing machine. Stack the dishwasher and start it. Thank you. *Remove any open foods from refrigerator(s) and freezer(s). Put all trash in the Garbage cans in garage. trash Pick Up is Tuesday, if you are there, please roll the Bear Proof Cans to end of drive-way, thank you so much. NOTE: This is a quiet, lovely neighborhood, please respect your neighbors. Please help our cleaning crew by following the Check Out procedures given to you on your Welcome Letter there, more House 'Tips' for you on it too. And, please leave your review, your experience here, in the Guest Book provided on the dining room side table, thank you and please stay again soon.